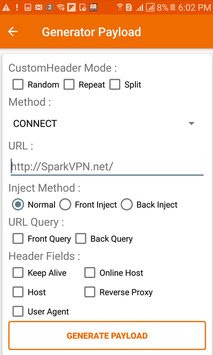 In this post, I will be showing you How To Use Latest unlimited Spark VPN Settings/Config File For MTN Free Browsing Cheat. This free MTN. Nigeria free browsing cheat/tweak is blazing and i have prepared or compiled all the requirements and configuration files you will be needing in this post. This MTN free browsing can be used in other android VPN applications like XP Psiphon VPN, tweakware app and others. Note that this MTN free browsing works on Android smartphones and computer system (PC) as well. Things you need for MTN unlimited free browsing cheat/tweak Free Browsing. Free internet Bnagladesh, Dubai, Philipine, Nijeria, Brazil, India, Pakistan & Others All Country. Launch spark vpn app installed, locate the menu at the top right side of the screen and Tap on (TWEAK). Wait for few seconds and congratulations as you are now able to enjoy the MTN unlimited free browsing cheat. Almost every cheat/tweak running on your Android smartphone can as well be enjoyed on your comouter system (PC) at it's maximum level and it all depends on your Android network availability because this will determine the browsing speed. To be able to use this cheat/tweak on your PC you will be using an application called PdaNet which will be running on your android phone and windows PC as well click on the link for more info. I will like to know if this unlimited MTN tweak/cheat worked for you via the comments box on this blog raphblog.com.ng below.